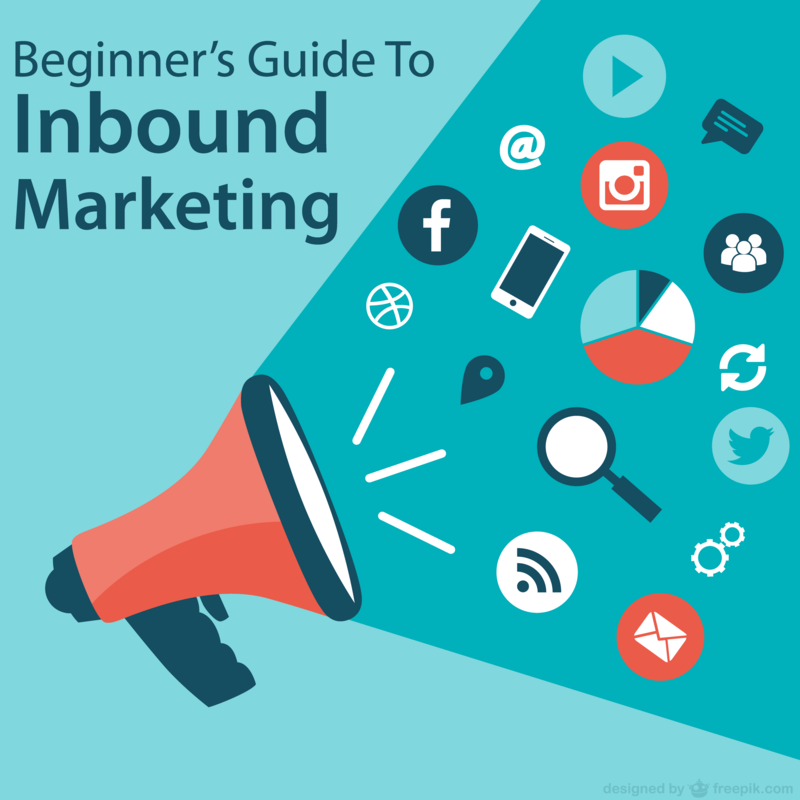 There is allot of talk around “inbound marketing” and as a guide to what it means to a business. Social media marketing agencies and practitioners seem to have developed a language of their own as digital marketing has become the dominant channel. Terms such as marketing automation, marketing qualified leads, social selling and lead nurturing are now common place words in the quest for business to find more customers. Here we will try to help you understand some of this vocabulary. leads captured from inbound marketing cost 60% less traditional forms of lead generation. The reality is that an inbound marketing strategy has more or less the same goals as outbound marketing so the difference between them is not what any company wants from the marketing effort but how it goes about getting it. Inbound marketing is focused on attracting IN buyers to consider a brand usually with content as the bait (articles, videos, images, whitepapers etc) while outbound marketing employs diversion tactics (online ads, direct mail, cold calling) to get buyers attention. 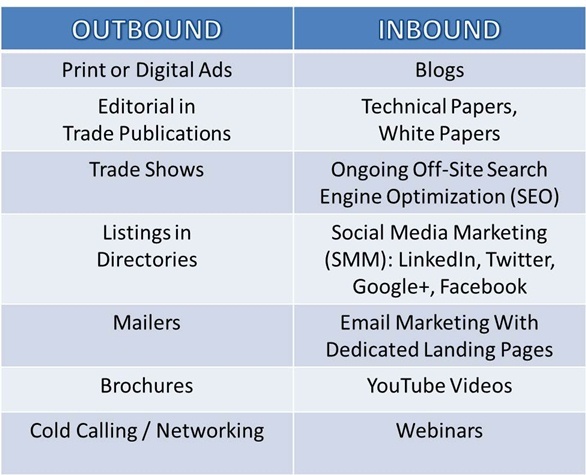 Most businesses would use a mixture of inbound and outbound marketing. A worrying trend is that some effective outbound activities like prospecting and lead generation via sales people is becoming dormant as too many start-ups or small businesses rely exclusively on inbound marketing to deliver leads and sales. For a whole host of reasons, inbound marketing is now the primary channel deployed to engage buyers when considering a purchase due to the more non-interruption nature of inbound marketing. Below are a list of activities and terms relating to inbound marketing, so next time a social media marketing agency speaks about how to put in place a plan then you will be well prepared to talk about it. While content is the rock upon which inbound marketing is built there is more to this strategy than articles, it also includes the use of social selling, targeting long tail keywords, interest sharing, engaging in social network conversations, attracting social media influencers and managing multi platform social channels. So here are some inbound buzzwords to improve your marketing speak. The inbound marketing plan is basically a publishing calendar of activities including goals and targets covering blogging, content themes, articles, and whitepapers, landing pages, social networks engagement, social selling, lead generation, traffic and engagement in social media conversations. A recent term added to the marketing vocabulary. Mainly a tactic employed by start-ups in the App or SaaS space, growth hacking works on out of the box thinking blended with technology to try to achieve massive growth in numbers in a short pace of time. The sole focus of using this as a strategy is to grow big (web traffic, social media followers etc but not revenue) quick so every action is designed to drive that growth. This is about taking a marketing campaign, seeding it to other people and hoping the content appeals on a large enough scale to make the campaign grow rapidly. It is the multi level marketing of the digital age. Think “Ice Bucket Challenge”. Lots of marketing people go to bed at night dreaming about their image, video or article going viral. However the reality is there is little control when it comes to what will go viral. To try and make viral marketing work the key is to create some unusual content that will get lots of people to promote it for you. The more people who share your content will lead to increased brand exposure. It boils down to encouraging people to plug you to their social media audiences. This refers to the testing of two different versions of the same email template, landing page or call to action (CTA) to figure out which version delivers the best results. A/B testing is something all marketers should do. Examples would be to take a call to action and test it with different strap lines, colours, text, and or with a different image. This allows you to determine which call to action performed better. So don’t guess as different messaging works to different audiences and even geo-locations. Always be testing as even a small percentage increase in leads or traffic can have a huge impact on sales (depending on your average order value). Content marketing is the seed that will grow to capture future opportunities for web traffic, leads and customers. It is the bedrock upon which inbound marketing was formed and still powers. It involves the creating and distribution of valuable, relevant content on a consistent basis (daily, weekly) to attract buyers with the goal of getting the customer to take some predetermined actions. The content created is heavily keyword/SEO orientated the majority of time for a start-up and a high percentage of the time for companies with larger databases. Marketing automation is software that is used to automate large parts of the marketing process like lead nurturing, content publishing to social media or auto-responder emails. This software usually appeals to mid-sized upwards companies with larger databases or well trafficked sites. Marketing automation is mostly used to improve the nurturing, conversion and closing stages of the sales funnel and is not a one fit fits all solution. The hard work of getting traffic and creating content is still yours to complete. Social selling is a great inbound tactic, despite its name it is not focused on sales but rather selling oneself or a brand to raise awareness to buyers of what you offer. It is a subtle and patient tactic where time is spent building up trust or “emotional lodgements”. It works on the premise that social media accounts are a fantastic broadcast channel while also a place to gradually build relationships and make connections. The key is to share content from other sources (not just your own), like other articles, participate in social conversations and provide regular updates. Social selling can be used as the key to unlock sales calls if used correctly, otherwise you are seen as a smash and grab merchant. This is the marketing or sales process that is set in motion after someone downloads or fills in a form (newsletter, white paper) on your website. In the B2B sales environment it could be a series of emails together will social selling and direct sales contract. In B2C it usually involves a series of emails. The skill here is that when someone downloads a piece of content from your site, you ask (and give reasons) for them to provide their email address. Now with the verified and opted-in email address, you can implement a series of emails to be sent to them in the next days, week or month after they first signed up to downloaded something. Lead nurturing is important as it reduces your cost of customer acquisition and allows you to build a relationship as you know what they are interested in from your offerings. Be careful not to over expect the speed of developing the relationship or put too much urgency into the nurturing as their initial sign-up could only be a top of the funnel action. This term usually applies to your content marketing efforts and is the SEO keywords you have selected to target. These keywords are normally three plus words such as “social media marketing in Ireland” and are not as competitive in Google as a one word keyword such as “marketing.” Google also auto suggests long tail keywords so research these as part of your content strategy. Can I target hot or one word keyword, you ask? Sure as lots of people are probably searching on that word daily but on the flipside your competitors are targeting these keywords too. It could take years to even get on page 5 of Google for a heavily trafficked keyword. Ten or twenty well indexed long tail keywords when combined will deliver just as much traffic in the medium term as a single keyword. So when creating content titles and web URL’s, choose longer, more detailed keywords. If you research your buyer profiles well enough you will get clicks and views from potential buyers from your target market faster than you think. The above is not a complete list of phrases as new words and terms come into play all the time around inbound marketing but hopefully by the time you have read this article, some of them are still relevant. Thanks for reading.